thedevotedwoman: are we too "beautified" to recognize? So, yesterday after an early appointment at my pain management doctor ($25/insurance copay), I was out-n-about running some errands and doing some Christmas shopping with Momba. We had several items to check off our to-do list such as upgrading Momba's cell phone at Verizon for a newer model ($150), hitting Bath and Body Works for more plug-in air fresheners to make our home smell more festive for the upcoming holiday ($50), and picking up groceries ($200). Also, as we were out, we decided to stop and have a quick lunch at Salata ($25). "Victoria, how much do you cost? If you were to tally up everything right now... how much are you worth today?" Puzzled, I began calculating my outfit in approximate dollar figures. Ugg loafers ($100), Victoria's Secret underwear and bra ($60), Michael Kors tracksuit ($150), my purse, keychain, rings, watch, earrings, necklace, eyeglasses (almost $2000... seriously, phew?!!). Then I started to think about the products I use to primp and get ready with everyday... fancy shampoos, conditioners, make-up products, fragrances... easily another $100 worth of goops, powders, creams, and what-not. I thought about the prescription I would be dropping off later at our nearby pharmacy. The breakfast I ate earlier, and the dinner I would eat once I returned home. The vehicle Momba and I puttered around town in to get to all our to-do list destinations. I even thought about the dog and cat food I would be dishing out to my happy, healthy pets who were, no doubt, snoozing comfortably while I was away. Humbly, I responded, "Lord, I would cost a lot of money.... in fact, too much." On this normal December day, I had casually overlooked such things. I had forgotten all that was available and affordable for me to garb and groom myself with. Mind you, I wasn't even remotely fancy or dressed up yesterday... I was in a comfortable, everyday, running-around-town tracksuit armed with a to-do list and car keys! When I returned home, I opened our mail full of incoming Christmas cards and sentiments from family and friends, and this got me further thinking... Truly, none of my peeps are lacking. Sure, we do not consider ourselves wealthy or well-to-do. Some have heavy college loans. Some have debt. Some are in need of employment. Some are sick and under-the-weather. But all of us still have a roof over our heads, beds to sleep on, clothes on our backs, food in our tummies. We all are blessed with adornments, detergents, running water, electricity. We have computers, phones, televisions, automobiles. We can afford milk, eggs, bread, flour, fruit, vegetables, cheese, butter... and many appliances to keep such items cold, frozen, toasted and baked to our personal liking. We have tools in our garages, shoes in our closets, insulation in our attics. Yes, truly we all have much. So, sooo much! I whispered, "We cost a lot, don't we, Lord? But, sadly, we... I... do not always act like it." "Victoria, how much do others cost? How much are they worth to Me? ...to you?" Memories of those in less fortunate circumstances came rushing back into my dense noggin. Folks who may be fortunate enough to own at least one used t-shirt and one torn pair of pants. Folks who must carry gallons of rotten water back and forth from dirty lakes and/or reservoirs to their tents and/or shelters - all to feed their families. Folks with illnesses, who live dehydrated and/or without any aid to manage painful conditions. These folks have no pharmacy. They have no grocery store with aisles and aisles of options. They have no excess, no adornment, no education. Yet, these are whom the Lord says He loves the most. They are who Jesus came to pay the ultimate price for. The poor, the needy, the lost, the broken... he came for the sick, the tired, the lonely, the sad. So, how much do these precious people cost to God? And do I value their worth as much as He does? Do I love them as much as He loves? Or am I too "beautified" to recognize? But, what if I had removed my "outer man" from the equation and valued my cost against the price Christ paid for me at Calvary? What if I had lived yesterday deliberately looking through His spiritual lens - considering what He had already sacrificed and given to me in order that I too might sacrifice and give to others in His Name? Suddenly, all these worldly bows and ribbons seem worthless, don't they? Instead, His Way seems soon much more important... even urgent! Folks, Proverbs 14:31 says, "Whoever oppresses the poor shows contempt for their Maker, but whoever is kind to the needy honors God." 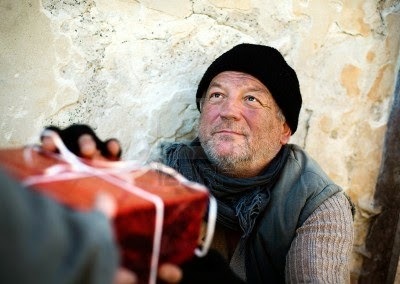 Today... this very day, how kind have we been to the poor and needy? Does it match how kindly we treat our own selves? Does it remotely look like God's kindness toward us? Sadly, I think many of us are too busy with to-do lists and Christmas shopping to notice such things. I fear we are running through the Walmart's and Targets of the world unaware that we are living in contempt of our Maker. Clearly, I too am not immune to this sin. I forget to love and esteem others on any given December day just as much as the next guy. But just because we are in company together on this, dear readers, does not make it excusable, or holy. How much do others cost to Jesus? And, is the cost too high for us to lovingly pay in thankful obedience? Perhaps this new day is the day to esteem both ourselves and others with the spiritual eyes of our Savior, and follow His example of sacrifice. As radical as this may sound to some, I challenge you right now to do something a little crazy... take a moment to add up your cost. Add up the bankroll of this normal day of your life (clothes, food, fuel, products, etc. ), and then ask the Lord to show you how much of it you should actually be giving away. What cost is God asking you to surrender? What is worthwhile in God's economy and, in response, are you making wise investments that match the truth of His Word? Today, will you give the hungry something to eat? Today, will you give the thirsty something to drink? Today, will you offer shelter, clothing, medicine, and hope? Or are you too "beautified" to recognize? According to the latest statistics, over 840 million people worldwide are chronically undernourished, and each day 26,000 young children die due to poverty, hunger, and preventable diseases. Lord, please have mercy upon us today, and afford us Your vision so that we may regroup and repeat the sounding joy of Your Kingdom to this world in current need. Remind us regularly that we are utterly bankrupt without You and completely unworthy of Your eternity. And yet, you love us and offer us a rich new life in Christ so that we may become worthy in Your magnificent Name! So today, please teach us to be holy in your sight by covering all that we are with YOU. Show us where to love and give as You have loved and given to us.